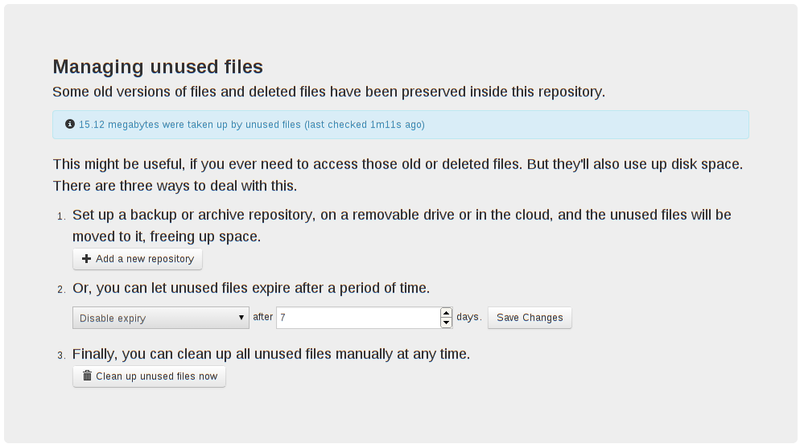 Built the UI to manage unused files. Testing yesterday's work, I found several problems that prevented the assistant from moving unused files around, and fixed them. It seems to be working pretty well now. An additional question on the windows build: which of the backends can actually make use of windows proxy settings? I guess if webdav was in the list of supported backends, it would work fine, since it is only http, but since it is missing, which of the others would work through just a standard configured squid proxy? For my work machine this is the only way to reach the outside world, doing https to my web server. AFAICS, the Windows build does include WebDAV support. I don't know about Windows proxy stuff. If it requires the program to do something, git-annex almost certianly does not do it. well, at least in the assistant there is no selection to add a webdav repository - only box.com, rsync.net, S3, remote ssh, and the archives on glazier or internet archive. It is the binary version from 16th this month. I thought it was still excluded due to the compiler crashes you wrote about, because it doesn't show up in the webapp as option. I was scratching my head anyway about that windows build, because there was nothing about setting up encryption in the configuration in the webapp. Proxy support on Windows is kinda like proxy support on linux when you pull the proxy from gnome settings - just it is pulled from the registry. I don't know how Haskell HTTP client libraries handle it, only know it for Python - there the client libraries usually grab proxy settings automatically from the system configuration. Another option which could work for me to get through our firewall at work would be ssh - I can use ssh with proxy commands to reach the outside, but didn't yet find the used ssh configs on the windows git-annex installation - it doesn't use the one in ~/.ssh, I added my proxy commands there, but that isn't used. Home directory is C:/Users/xgwsbae/ (git bash gives /c/Users/xgwsbae in $HOME) ... looks like something got confuzzled between Windows and Unix there. Some things (not git-annex) default to /home/$USER when appropriate env vars are not set. There is a bug open about that, ?assistant using the incorrect path on windows?, although I don't know what it makes sense for git-annex to do to deal with it. box.com is a webdav repository. It is the only webdav repository the webapp currently supports setting up, although you can configure any webdav remote you like at the command line and the assistant will then be able to use it. Will be curious to hear if the http-conduit library used for webdav supports proxies. If not, that would certianly seem a good place to file a bug. Unofrtunately, git-annex uses 2 or 3 other http stacks in other places too. Well, according to the hackage documentation of http conduit it seems it at least supports proxies when youre code gives it the proxy host and port. But the link about the problem with environment settings helped me to get around my immediate problem by just running annex from the git bash (which is prefereably to me most of the time anyway). So I could set up my annex on my work machine and just tunnel out with ProxyCommand via our ssh gateway. Yay!